There’s a new historian in town, and he’s not your typical historian. Even though Erik Pekar has only 18 years under his belt, he’s got knowledge that dates back to the 1700s. 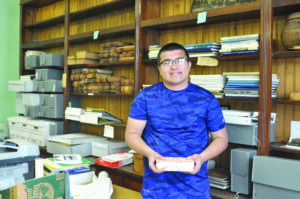 “I have a burning passion for learning and sharing the history … businesses, buildings, people,” he said. The job has been vacant since former Granville historian, Lee Tugas, left his post in Nov. 2014. Tugas was the town’s historian for a year. Before that Edith Sparling held the position for three years. She resigned in March 2013. “Since November 2014, we were without a historian,” said Jenny Martelle, town clerk. Pekar said he is eager to research, record and catalogue Granville’s history – and he plans to do it in a more modern way: by using social media and digital documenting. “I want to have a little bit of a modern upgrade … and to preserve all of the stuff, scanning things in so you don’t have to handle it as much,” he said. He has already started posting old-time photos and documents on the “You know you’re from Granville when…” Facebook page, but he’ll soon start his own page, where he can share what he calls “bittersweet” memories of yesteryear.